Every week, when my little neighbors come for their visit, they always ask me to tell them a story. They don’t want it to be a story they already know. It has to be one I make up on the spot. This old brain doesn’t think as quickly as it used to, and it’s tough to come up with a new story “thinking on my feet,” as it were. (I’m expected to tell my story standing up so I can act it out as I go along.) Though I don’t know how my story will begin, I always know how it will finish: with a happy ending. When I was growing up, I always had my head in a book. I ready every Louisa May Alcott book I could get my hands on and all the Nancy Drew mysteries. In fact, when we would go to Ohio in the summer to visit my grandparents and cousins, my cousin Cheryl and I traded our Nancy Drew books with each other to make sure we didn’t miss one. We were kind of sad when there weren’t any left that we hadn’t already read. The most important prerequisites of the books I liked to read were that they had to have a hero or heroine that I would like as a friend, and they had to have a happy ending. Those two things were easy to come by in children’s books, especially back then. It wasn’t that everything in the story had to be wonderful. That would have been boring. Stories have to have conflict. I was devastated when Beth died in Little Women. I cried openly about it. But at the end, everything worked out wonderfully. Today’s children’s stories still follow the same path, for the most part, but sometimes they seem darker. I haven’t outgrown my desire for happy endings, although if the ending isn’t actually happy but is satisfying, I’m usually okay with it. But just okay. I’d rather have happy any day. In fact, when I go to the movies, if I’ve heard that a certain film doesn’t have a happy ending, I stay away from it. I go to movies to escape. I don’t need another dose of real life. I want to come out smiling. My brother is the same way. Once, when we were watching a rented movie at my house, it looked like its ending couldn’t possibly turn out well for the main character. Since we loved the movie up to that point, we were both bracing for a less-than-satisfying ending, wishing we hadn’t invested our time and emotions into a movie that would leave us feeling sad. But then it had a twist at the end, a wonderful twist that left everything better than we could have imagined, everything we could have hoped for. We loved it! I can’t control everything that happens in my life. Life is full of sorrows as well as joys. However, I can control what I read and watch, and give me a book with complications, twists and turns, even a little bit of tragedy, but when I finish the last page, I want to be smiling. I just finished a terrific book, In Memory of Running by Ron McLarty that did just that. This entry was posted in Just Blogging and tagged books, children, Happy ending, life, Literature, Memory of Running, movies, personal, Reading. Bookmark the permalink. What a challenge to make up a story every week – but it sounds like fun! I love that idea. I think I might try that next time one if them asks me to tell them a story. Hope they let me get away with it! I love to hear that your neighbors come over to hear stories from you. How wonderful!! My husband has often said the same thing about movies. He wants a happy ending…life has enough troubles. Deep down, I feel the same, but I know the critics reward angst and sorrow and tragedy.loved your post! I know that about the critics. They pan a movie that they call “predictable” with a happy ending. They want movies that reflect real life. Not everyone is like us, though, history gal. My children like complicated, serious books. They read Proust, Tolstoy, etc. I don’t have the patience. I have read Tolstoy, and loved him. I haven’t read Proust. Now you just added to my bucket list, CE!!!! Well what’s wrong with us? Me either!!! I can’t even figure out their alphabet! I’m glad you liked it, Johnathan. Thank you for the publicity! Just thinking…perhaps when Nanowrimo comes up, you would consider a children’s book or a YA novel. There is room for happy endings there and I bet there’s one inside you. 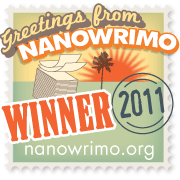 Just thinking about doing NaNoWriMo again gives me the shakes, Georgette! However…if I can come up with an idea I want to work with, who knows? My curiosity is tingling … would you share the title of the movie you and your bother were watching? I do love a good movie but they seem to be few and far between these days. Thanks so much for the book title. The movie is Limitless with Bradley Cooper. As for the book, I usually like a certain type of main character, and the one in the book definitely is not a match. But I began to care so much what happened to this character, that I couldn’t put the book down. It was a great read. Hope you like it. I’m the same way about movies; which is why we RARELY go to the movies. I can’t remember the last time I was in a movie theater. I really don’t like the feeling of being transported to another time and place…. I’m just the opposite. I love being transported to another time and place. I especially like a good sci fi movie. And I loved all the Harry Potter movies and The Lord of the Rings. And the new Star Trek movies, of course. Some people love fantasy, and some people don’t. I don’t love all fantasy, though. Lord of the Rings is exceptional fantasy. Me too!! I want a happy ending, especially in a movie. Like you, I want to be uplifted, entertained, encouraged or just have a smile on my face and be ‘happy’ watching a movie because life is depressing enough already! It’s my husband who is the good story teller and my eldest son now tells stories to his eldest– fantastic entertainment. Many stories became lifesavers to get the boys to finish a longer than expected hike. Good for you! You should tape yourself! I can assure you that my stories are not tape-worthy, Liz! I make them up as I go along. Sometimes it’s painful to pull new ideas out of this old head. I agree, movies are for escape. How nice of you to tell your neighbor kids stories! They keep me on my toes, Amy. Let me know what you think of it, Stacia. A really neat thing about the book is that I recommended it to my sister-in-law, not only because I loved it, but because the main character is from Providence, where my sister-in-law grew up. She said the author’s name sounded familiar, so she looked him up and realized that she knew him. They had gone to high school together! I too need happy endings, but I have one additional criteria… I need to be inspired by the inner strength and/or thought processes of the main character. Absolutely, Carol. I don’t want a namby pamby main character. LOL. You and George are so alike, Dor. We own that book and other similar ones. George likes reading about real life. I like fiction. In real life, everybody dies at the end. “In real life, everybody dies at the end.” I like happy endings, so thanks for making me smile today. Glad I made you smile, Patti! Do you go to the Open Mic readings? I’ve been to one or two. I think the Show and Grows are really good events because you get to read a longer piece and get critiqued. The regular Open Mics are really geared towards poetry, and you don’t get any feedback. He owns that one, too, Dor. LOL. I will have to look up Devil’s Dream.